Maison du Boulanger - Turret Goldsmith (XVI c.): This pretty half-timbered house in 1964 the first renovated in the historic center of Troyes home. It is as a symbol for all lovers of the city: it had to be shaved and only a long struggle by advocates of local historical heritage allowed to save. We call this property the "Maison du Boulanger". It has a cantilever and a gable roof with a strong avant-body. On the roof, the window that opens onto the street Paillot de Montabert still has the pulley that allowed up to the attic bakers flour bags. 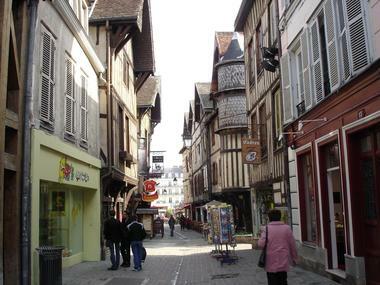 Since 1975 it houses the cultural center of Troyes. This area, including in particular the street from Domino, current street Paillot de Montabert is the sixteenth and seventeenth century. the goldsmiths. One of them, Francis Roize, built the house on the opposite corner of the square between 1578 and 1618. Coveted space is there that he had placed his staircase cantilevered in a turret to floors and conical roof covered with diamond-shaped slate, supported by two caryatids and Atlantean. Hotel Juvenal Orsini (XVI c.): This hotel Renaissance belonged since the beginning of the fifteenth century. a large family of Trojan clothiers and magistrates, Jouvenel, ennobled under the name Juvenal Orsini. Champeaux the street is also called "street of the drapery." 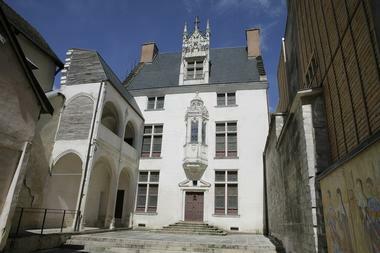 Jean Jouvenel or Juvenal (circa 1360-1431), magistrate and Troyes to Paris, was appointed in 1388, provost of Paris. Among his sixteen children, John, Archbishop of Reims, participates in the revision of the trial of Joan of Arc, and William (1401-1472), is Chancellor of the kings of France Charles VII and Louis XI; Jacques is the sponsor of a famous manuscript richly illustrated with miniatures: the historiarum Mare Giovanni Colonna (preserved in the National Library of France). The hotel was rebuilt in white stones after the great fire of 1524. Facade large mullioned windows moldings is adorned with a beautiful Gothic oriel three sides, topped by a finely carved turret day (restored seventeenth century.). Domestic donors and windows represent the Crucifixion. The roof features a large Gothic window of the fifteenth century. from an earlier building. There is no review about Rue Champeaux, be the first to leave one !